Somehow, I signed up to participate in a swap this summer: Under the Sea Swap on IG. Signing up for it was very impulsive on my part, I had recently vowed to never participate in a swap, yet a few months later, I signed up for one. I guess I was intrigued by the talent of the swap organizer - Carla and I liked the theme. I did my usual zippered backing. This pillow fits a 18" pillow form nicely. On the next post, I will showcase what I received in return. 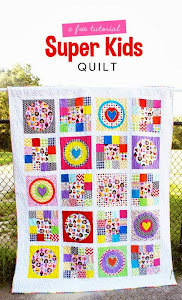 Linking up with Sew Cute Tuesday at Young Texan Mama. Not long after my youngest was born, one of my brother's, Will, asked me if I could make him a quilt. I was already aware that the quilts I had made for him previously were really dying. There was a period in my late high school and early adult years when I only bought Joann's/Wal Mart fabrics, used that horrible wavy/crinkly polyester batting, and tied all my quilts with embroidery floss. Unsurprisingly, those quilts have worn out fast. Normally, if someone asked me to make them a quilt, I might be hesitant to agree. It's a commitment- in time and money. But I felt like I should do this for my brother, who's never really asked anything of me. I already knew he appreciated the previous quilts I had made for him, so I wasn't worried that my efforts would be taken for granted. Before the summer, I really contemplated how I could use my ever-growing stash of Moda Lush fabrics. (Paint by Number deer, birds, flowers, etc.). I just could never figure it out- which makes me feel impatient and frustrated because I love those fabrics and I need to use them. Before my NH trip, I texted Will and asked him for a little direction of what he likes. He responded that he likes the color green. The day before I left for NH, I was up late cramming fabrics into a suitcase and included a bunch of stash fabrics filled with green, blue, and some yellow. I decided that my summer project in NH would be focusing on making him that quilt. A big part of my motivation was that if I finished it in time, I would be able to give it to him in person and see his reaction. Sending quilty gifts is fine (well, except for my fear of losing something handmade and irreplaceable in the mail!) but it's so much better to see loved one's in-person reactions! So I don't have any progress photos, this post just has details of the finished quilt. I pretty much only worked on this quilt late at night after my kids were in bed in July and August. I'll admit that I kind of had to force myself, sometimes, to make progress on it, because the days were long and tiring and I often did not feel like sewing. I was essentially a single parent and it was exhausting. It measured 98 x 110 approximately. I trimmed down the patchwork blocks to 7" with this handy ruler my mom had in her stash of sewing supplies. I used up lots of scraps and stash with this project. The color combination of my prints is probably not my most favorite color scheme I have ever done and I ran into a real problem when I tried to pair my crazy nine-patches with this Lizzy House dark green starry print. That print is SO dark green and did not go well with the 174 patchwork blocks I had already assembled- I nearly had a meltdown! I finally decided to visit a LQS (Bits 'N Pieces) and bought some Kona Bluegrass to be the background fabric for my quilt. I was able to rent some time at my favorite place: Laurena's Longarm Quilting and had a great day there. I used the Statler Stitcher and chose a pattern called "Diagonal Plaid." I chose a green variegated thread for the quilting. My brother was surprised to receive the quilt and he was happy and obliging to help me take some photos. I let his adorable girlfriend in on the secret before giving him the quilt and she was very excited for him and attested to how worn out his other quilts had become. It was an interesting experience to have to put this quilt together at my mom's house with only the materials I had pre-packed. There were many times when I wanted to give up and just work on it back in Colorado later or even just give him one of my queen sized quilts from my stash of finished quilts. I think it was good for me to just keep working on it and have a tangible sewing goal for the summer, Being back home among family and friends was definitely an emotional rollercoaster and I think it was healthy for me to have a sewing project that helped ground me and my crazy feelings. I have to be honest, I am not extremely proud of the color/fabric choices of this quilt but I am glad I pressed on and focused on "finished is better than perfect." 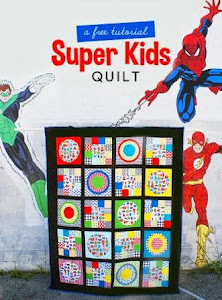 I am not trying to say that I gave Will something I hated or wasn't completely proud of - I do wish I had picked a background color/fabric that harmonized better with the quilt blocks and just had a better vision for the end project from the beginning. Instead, I just started sewing and figured it out as I went and didn't end up loving the end result. It was also difficult to press on without access to my stash, books, and tools. I think if I hadn't had the deadline of trying to give it to him this summer, the hope of finishing a quilt for him may very well have dragged on for another few years. I know he's happy to have it and isn't as concerned about my artistic goals and aspirations. He wanted a quilt and he likes green, there's no need to beat myself up about not creating some kind of amazing masterpiece. Like for the backing, it would've been silly of me to spend $70 on a perfectly coordinated fabric- using what I had worked just as well and was just as appreciated. Thanks for reading: sometimes I see this blog as a bit of an online journal and writing this all out helps me complete the experience of a project by processing all of the highs and lows as well as my feelings on the experience of making. It's time to share my fabric shopping! I missed New England quilts stores so much. In Colorado, I really don't have "stash enhancement" shopping trips; I only visit my LQS if I need something very specific. Colorado stores near me don't have good sales and hefty sales taxes make full price fabric close to $13 a yard. So while in New Hampshire for the summer, I really indulged in lots of fabric shopping! I didn't realize how much I missed buying fabric in person instead of just completing online orders. So here's the outside of one of my favorite places: Marden's. It's a discount store much like Big Lots: lots of junk. But they are also the world's largest fabric liquidator and sell fabric for no more than $5 a yard. I did really well there when Nick and I visited there at the beginning of our weekend getaway to North Conway, NH to celebrate our 10 year anniversary. So here's what I chose: the rose fabrics in the middle are some of my favorite fabrics of all time- I had previously used up my precious half yards and was so happy to find more! I allowed myself to get a few novelty/juvenile prints in anticipation of someday making items for an Etsy store (more on that in another post). On the way home from our trip we had planned to drop by the famous Keepsake Quilting. It turned out that we had inadvertently arrived in the midst of their famous tent sale! While living in Massachusetts, I never made the effort to go to the tent sale because it was always on a weekday and that was a stage of life when my babies were really young and it wasn't practical to attend. So I was pretty happy to be able to go and get some bargains, but if we had known about the tent sale, I probably wouldn't have bought so much fabric at Marden's just a few days before. The tent sale is quite a crazy event- women park and sleep overnight to take advantage of the deals the next day. The lines to pay were very long and moved at a snail's pace. One poor soul fainted while waiting in line. We met a group of ladies who had chartered a bus to attend the sale but started panicking when the bus driver insisted that they had to abandon their selections and get back on the bus to return home. Luckily, many women agreed to let them go ahead in line so that they could pay and not leave empty handed. These are the fabrics that I bought off the sale bolts. The prices were between $3-5 per yard. These are the fabrics that I chose from the boxes and packages available. Good choices for sashing and backing I think. The prices ranged from about $2.30 per yard to $4 per yard. My best score was a huge bag of zippers. These are the kinds of zippers I use all of the time and the whole bag was about $5. I've already used seven of the zippers. Finally, I visited with my friend Hema, a friend from my days in the BMQG. Just after she moved, she opened an Etsy shop and I was fascinated and intrigued to learn about her business. These are the choices I made from her shop (the two larger cuts are organic knits! Eep!). It seems that her shop is on vacation, but I will update with a link to her shop upon her return. Yep, I did a lot of fabric shopping over the summer. Fabric is definitely my favorite souvenir! I love the possibilities and potential it all holds. Linking up to Sunday Stash at Molli Sparkles. I really like how this pillow came out! It feels very gratifying to take something that was unwanted and nearly discarded and giving it new life. I have quite a bit of thrifted pieces of embroidery, vintage fabrics and trims, second hand clothing that calls for repurposing, etc. and it's not doing me any good in a closet! I have a new goal to incorporate this "stuff" into useful, fun items at least twice a month. I hope you'll enjoy this new idea venture with me. And since I used all red, orange, and yellow scraps to complete this project (also very gratifying and along the same lines as using up something previously tucked away), I am linking up with the lovely ladies at Scraptastic Tuesday. Thanks so much for reading. August 2 is behind us now, a date that seemed so remote since we planned our trip to New Hampshire about a year ago. After being in the Northeast for about ten weeks, and returning home to Colorado- I've been on a bit of an emotional rollercoaster as I've reflected on my experience. My husband came with us for the first two weeks of our time out there but then returned to Colorado for work. I continued to stay in NH with my parents; spending time with family, visiting with friends, and doing many tourist-y things. In ten years of marriage, our family has had very few vacations; so the time back in NH, doing fun, recreational things, has felt very novel and special. I have to admit that my time without Nick there was difficult at times, I had a small taste of what single parenthood might be like. I didn't get a ton of sewing done. I did A LOT of fabric shopping. If you aren't interested in these touristy-family pictures, rest assured that my next few posts will focus on all sewing related things and I look forward to sharing the projects I did complete over June and July as well as my fabric shopping exploits. The day after we arrived, we drove straight for the beach. A huge theme of our time in the Northeast was visiting beaches and lakes- any setting with water I guess. Owen took a nap on the beach that day, doesn't that look so cozy? We visited amusement parks and museums. We had a great time. Every time Charlotte passed us on this carousel, she shouted, "Mom! This horse is so pretty!" A lot of our activities weren't super baby friendly but my little guy has such a laid back personality. He did really well with all of our travels. Colorado is a land locked state, so we found ourselves by the ocean as often as we could manage. The kids weren't very tolerant of the frigid water temperatures, so we spent a lot of time playing in the sand and looking for seashells. My sister joined us two weeks before we had to head back to Colorado. She was a big help and I think the kids liked seeing a new face besides mine. This picture was taken on the day before we flew back to Denver. It just looks magical to me. I definitely have a bit of a "vacation hangover" since returning to Colorado. I was exhausted for the first few days of our return and the kids were too. My oldest starts full day first grade tomorrow, my ward (congregation) was split on Sunday and we are in a different stake (big changes in the local organization of our church), and a good friend and family member is currently visiting from Texas. It's all been a lot to take in! It's been difficult to try to catch up on life's responsibilities lately. But I've missed sharing myself in this space and plan to update frequently as I catch up on my sewing and what I have accomplished in the past few months. Thanks for reading! I'll be back very soon.